On 2 October 2006 was minted the awaited 100 Euro Weimar gold coin for which was manifested a strong demand since its issuing was announced by the German government. The 100 Euro gold coin, celebrating the Classical Weimar, belongs to a series of coins recognized and appreciated all over the world. We are talking about gold coins engraved in order to commemorate German cities that were included on the UNESCO World Heritage Sites list. It is one of the greatest distinctions because it clearly suggests the historic and cultural impact of that particular town. Germany has many reasons to be proud of these distinctions and it chose the perfect way to commemorate the belonging to the UNESCO Heritage list: it minted gold coins with the most representative elements from those particular towns. The first city to begin these 100 Euro gold coins series was Quedlinburg in 2003, in 2004 Bamberg, and then followed the 100 Euro Weimar gold coin in 2006. The 100 Euro Weimar gold coin weighs exactly 15.55 grams (1/2 troy ounces) of 24 carats gold. So it is a coin with 99.90% fineness and a diameter of 28 mm. The obverse of the 100 Euro Weimar gold coin depicts the classical Weimar which is absolutely the perfect rendition into gold of the former cultural capital of Europe, designed by Dietrichsdorf Stecher. These eleven monuments that are illustrated on the obverse have been included on the UNESCO list in 1998. 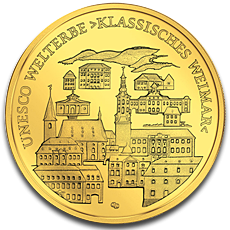 The inscriptions present on this side of this German gold bullion coin minted in 2006 are: UNESCO WELTERBE KLASSICHES WEIMAR. The reverse of the 100 Euro Weimar gold coin is the classic one for these 100 Euro gold coins, depicting the German Federal eagle and the European stars in number of twelve. There is also present the issuing year 2006 and the face value 100 EURO. Another inscription is BUNDESREPUBLIK DEUTSCHLAND. The letter A, placed under the eagle, means that the coin displayed on our website was minted in Berlin. The 100 Euro Weimar gold coin is perfect for collectors and for people passionate by arts, by poetry especially, since it is a coin that commemorates the town where the great poets Goethe and Schiller lived and worked. It is a gold coin as beautiful as the words written by Goethe, and it was issued to remember people about their cultural past. Even investors that will acquire these German gold coins, and among them the 100 Euro Weimar gold coin minted in 2006, only for the reason that they are manufactured from pure gold in a considerable weight and at an affordable price which in the future will turn out to be more than satisfactory profitable, will be struck by the beauty and charm emanated by these commemorative gold coins filled with history and culture. There were issued only 350,000 gold coins celebrating the Classical Weimar and demand has outgrown supply even before being released therefore if you want to be the owner of a 100 Euro Weimar gold coin, it gladly awaits you on our website.